I used to pride myself on being the person who tries a new entree with every trip to the same restaurant–I don’t know if I just got to the point where I had tried everything at all my favorite restaurants or if I had just gotten myself into a same-food stalemate, but I stopped trying new things for awhile. But not today. No sir! I made an impulsive decision during an awkward lesson on homosexuality in my psych class today to text Matt and suggest we make a super-quick Subway date during the hour I had between class and work. So we braved the blizzard to find the nearest Subway and satisfy my need for a homework-less, awkward-less hour in my day. 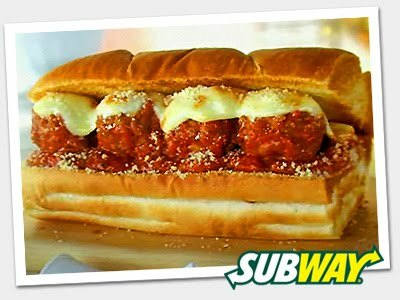 Upon arriving, I was tempted to go for one of my tried and true favorites like the cold cut trio or pastrami, but I decided to go all crazy and order something I’d never tried before: the Meatball Marinara sub. The real dilemma was what to put on it though–I think I annoyed the kid working there a bit with my pesky questions of what most people put on a sub like that and whether certain things would taste good on it or not. I ended up going pretty simple–provolone cheese and olives on the side with a little oregano and parmesan cheese sprinkled on top. Especially considering the chilly weather outside, the hot toasted sub tasted pretty good darn scrumptious. As far as a review goes, the bites were most delicious that included a perfectly mixed combo of meatball, olives, cheese, and marinara: those were the bites that would tempt me to order this meatball sub the next time I saw the first lacy snowflake ruining all my hopes of spring. However, every other bite seemed to consist of sauce, bread, and olives only–not the greatest combination to satisfy my ravenous appetite which had been steadily at work since 10:00 this morning. Nevertheless, I found the sub a perfectly lovely way to warm me up on a cold wintry day in April. The only way it could have been better would have been with a Dr. Pepper on the side and a slice of cheesecake to round it off :). Change It Up Successful? Yes–my appetite was satisfied, my palate refreshed by a new flavor, and my motivation to try new things has been renewed.